As many enlightened and conscious people are teaching, the foundation of all reality and what we create is the result of the relationship we are having with our self (self being a reflection of All There Is). If it is a loving, positive relationship we create constructive things, if it is fearful, and non-loving we create destructive things towards self, others and the world. We shall not focus on the wisdoms and tools needed to heal self since they are available in other writings. The focus here is a discussion of the effects of our self-relations and some amazing possible present and futuristic solutions (with a little help from some unseen mighty forces). Within this endeavor inspired by forces outside the human mind, we are affirming through a positive relationship with self that we can love our nation and planet back into health, ensuring both our survival while honoring the peoples upon her body and healing decades of ignorant, arrogant abuse, which we have forced upon our cosmic home. Lack of hope and “no one can really change things” will not be an aspect within this sharing. While we intend to be realistic, we are affirming that we are the creator creating all the time and what we can perceive we can achieve! In spite of all we have achieved in the greatness of America in the past and today, we are more divided and the “united” in The United States of America is being challenged. We feel the painful clearing and cleansing of the old paradigms in our government, politics, corporations, religions, educational and medical systems like never before. We sense and talk amongst ourselves that some big shift is upon us but we are not exactly sure what that is, good or bad? This material is going to look at the bad and the good and know it is all a ‘learning tool’ through our free will and choice to get us to the best and brightest expression of being human. The nature of the universe and we expressing and being that universe is to innately grow and expand. It cannot be otherwise, even if we often take a few steps back to get forward. 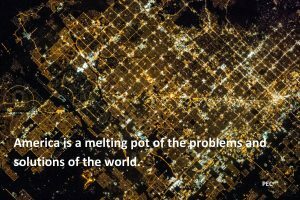 America is a melting pot of the problems and solutions of the world. It was inspired and created by the same higher realms forces that inspired this endeavor so that our brightest expression and light of ourselves can be brought out into this nation and the world: love, equality, harmony and balance for all. The future is not fixed, it is a moving dimension filled with possibilities and probabilities. We shall discuss many of these and how to bring them into our lives through internal transformation as well as institutional external shifts. Let us dedicate this endeavor to higher forces constantly leading us back to our Divinity from whence we came and the self-empowerment within each of us that makes this possible and probable.